I’m still grieving for my mother’s demise, I can’t deny it. The hole in my heart is still there, there seems a forlorn feeling deep in me. 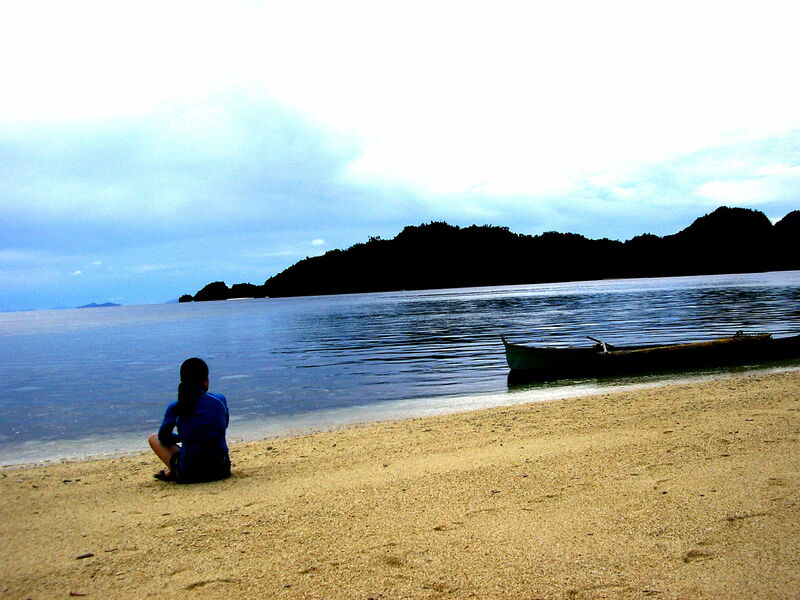 And I wanted to be away, alone in a deserted place to be just by myself. I need a quiet time, to reflect and embrace the pain and hopeful to cast it away soon inside me. I was weighing my options what to do and where to go, embattled by management principles yet I need to pursue it for my sanity’s sake. I have to limit expenses, for the past months there was too much cash outflow yet the inflows were in trickles and I need funds for my scheduled trips. But the holidays is gawking at me as if pointing a finger – getting a leave is not easy and I’m allowing the free days go down the drain – such opportunity loss! Last minute I decided to escape to Sohoton but without neglecting the essentials: attend the flag raising for the 112th Independence Day – singing the Pambansang Awit head held up, my right hand on my breast watching a 20×50 feet flag waving proudly up there gives a different kind of feeling; birthday breakfast with a good friend and catch up with her – women talks are too long! ; visit my optometrist for consultation and order my dailies; finish the laundry and grab some needs at the supermarket. Left on a Sunday after attending mass and a relaxed breakfast, I was bidding my time after all I’m on a vacation… Great Escape I was thankful I arrived in perfect shape and just in time, although I left CdeO with the 10am aircon bus, I step in at the reception center of the park at 620pm almost dark. The timing of the connecting vehicles was just perfect, when I arrived Hayanggabon port at Claver, my guide and the boat was already waiting. Joseph (the guide) said we should do some marketing for food, we did it hastily as it was almost getting dark. We sped off for the cruise riding on the waves, which is natural during late afternoons. Halfway, the waters have cleared and we cruised freely, orange skies in the horizon as the sun finally sets for the day. 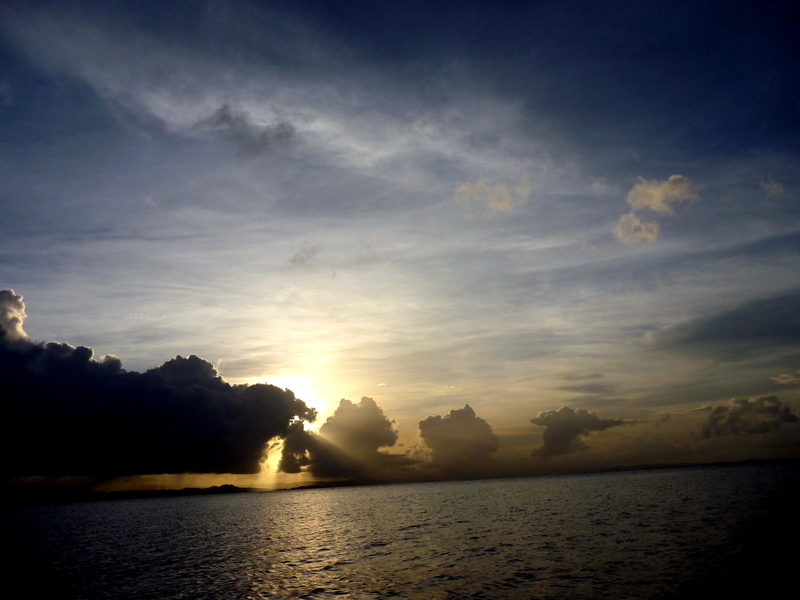 I haven’t arrived yet and I’m feeling good already, riding on the small boat with cool sea breeze on my face, surrounded by the vast blue sea and the green islets! The little mermaid in me is rejoicing, this is where I belong…. Until now, there’s still no electricity in the place, so when it gets totally dark the stars started to decorate the skies and illumined the waters. DH said I would spend the night at Tiktikan Lake since the guest house is fully booked. I admired the expertise of the boat people, the could easily operate the vehicle even in darkness. So we cruised to the lake and climbed the path to the cottage, it was like camping. It’s an open cottage but large, and I have an airbed with matching mosquito net, which is actually what I need – I don’t like the mosquitoes! My bed was on a corner, so I get a good view of the stars in the sky! DH said, I’m the “princess” of Joseph & Ranil during my stay. Indeed I was, they took care of my needs including cooking my food – such opulence! I woke up at dawn when the wind blew hard, in different directions my mosquito net is flying up – a little while it started to drizzle. Then I found out I got a message from Angel, which left me wondering since my bed spot has no signal! Nobody knew my escape except one little sister at home (in case for emergencies) and have no plans to chatter about it even to Angel! We went to another spot in Caasinan (because in the olden days, the community used to produce salt from this place) for another snorkel. The corals are more colorful, tremendous and varied and there was fish life although juveniles but it was too wonderful to behold – oh, I miss my cam! I could have taken pictures of the anthias over a table coral, the bright red clown fish on anemones, butterfly fish, wrasses, angel fish, bat fish, damsels and more. I spend more time just going around and around. Then we sailed back in time for lunch. In the afternoon, we went to another islet Pulong Gamay near a marine sanctuary and climb on its top and had a good overlooking view on surrounding waters. 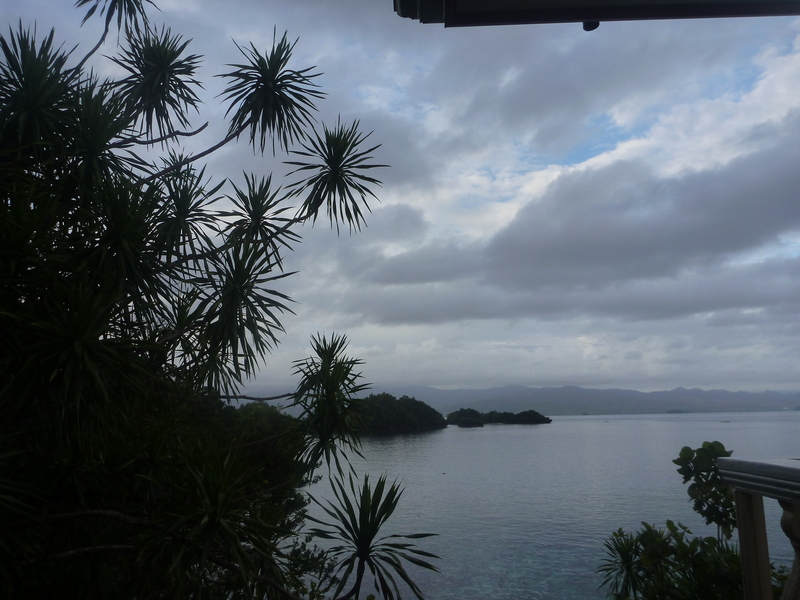 Then we sailed on the vast waters and visit Hidden Island Resort, which was somewhat deserted when we got there. We were allowed to come inside after telling we’re guests of DH. I was surprised when they have two sharks, five turtles, napoleon wrasse and other pelagics wading in the water pen! How could they do that? They are supposed to be in the wild… We didn’t stay long as the people there were not too friendly, perhaps disturbed by our presence. It’s a good place though but not as attractive in the pictures at the net! 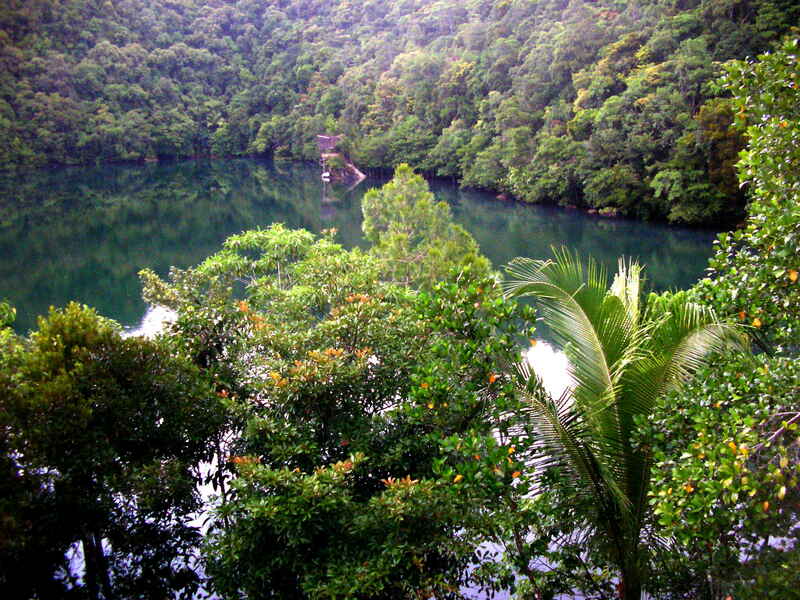 My sister and I planned for a summer trip to Sohoton Cove, we promised ourselves to once again relish the hidden splendor of this favorite spot alone. We shall be exploring a new route via Claver to get away with the long trip through General Luna to maximize our time. 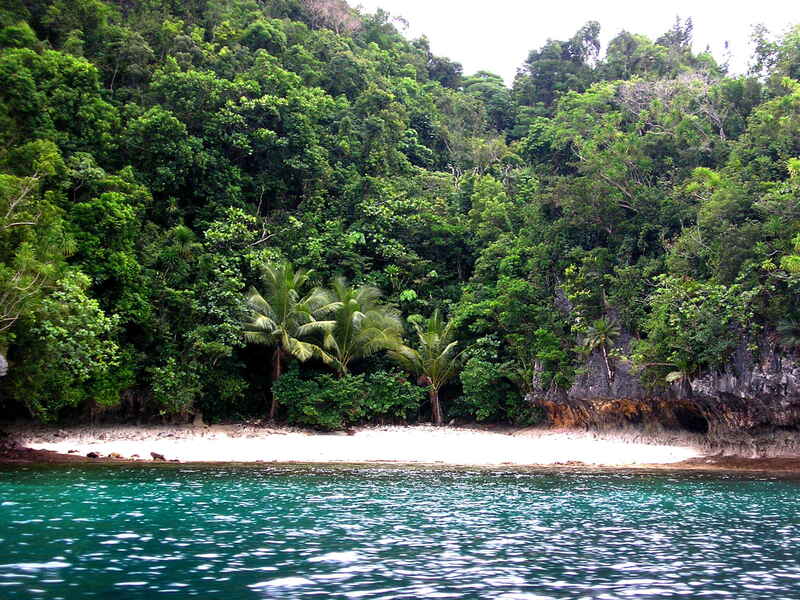 We wanted to see more of Sohoton’s other pride – the caves, lagoon, white beaches and islands. And we carefully scheduled it after the Holy Week, as we will spend the holy days at the farm – coming home – ou r tradition every year . But surprisingly, Angel asked to join us. I thought he would be joining the group tour we’re planning for our travel friends. I can’t find any valid reason to say no, I just thought it wont be too bad to have someone with me and Cherry in our private get-away trip. So after a quiet and relaxing sojourn at the farm, I rushed back to M. Calo on Easter Sunday to prepare for the trip – few chores to do for the rest of the day. At lunchtime I called up Angel to check if he arrived already and gave him directions for M. Calo. We talked about our trip and left him in the sanctuary of his room for awhile for a good rest – he just came from his Jomalig voyage. Kay and I hastily went to the supermarket for our needs, then did the backyard garden until Susan called up. I joined them at Razon’s after I dropped at Gaisano Mall for Odessa’s request. It was kind of treat after Karin’s (my inaanak) high school graduation. They dropped me home a little past 7pm so I could catch up for the last evening mass (in English). Kay and Angel joined me to attend the mass. We got back home by foot and run for few things and suggested to Angel to further explore Butuan by night. We went to my fave café – Margie’s Kitchen – one of city’s pride. 🙂 I was thrilled to let him try our much loved cookie monster and food for the gods! It wasn’t a mistake we went there – he love Margie’s and was sorry we have to leave before it closed at 1am. Deep blue waters, green islets, blue skies! We woke up early as agreed as we need to leave at 5am, we need to catch up an early bus for Surigao City. The bus finally left at 6am and it went smooth until we got our breakfast stop at Kitcharao. We dropped off upon reaching Bad-as to get another transpo for Claver. It would be something new as I haven’t tried this route, we waited for awhile for a bus to Tandag until the man I talked to suggested we took the jeepney bound for Carmen, Surigao Sur. Our contact kept on texting and finally reached me when we were in Gigaquit. We had a stop though at Parang where there were fresh melons on sale. We finally arrived at the stop for Hayanggabon Port, Dodo waiting for us. We took the boat for the Sohoton cruise which was about thirty minutes, fortunately we were blessed with a very good weather. We were transported to our lodgings in the lagoon to deposit our stuff, it was about lunch time. 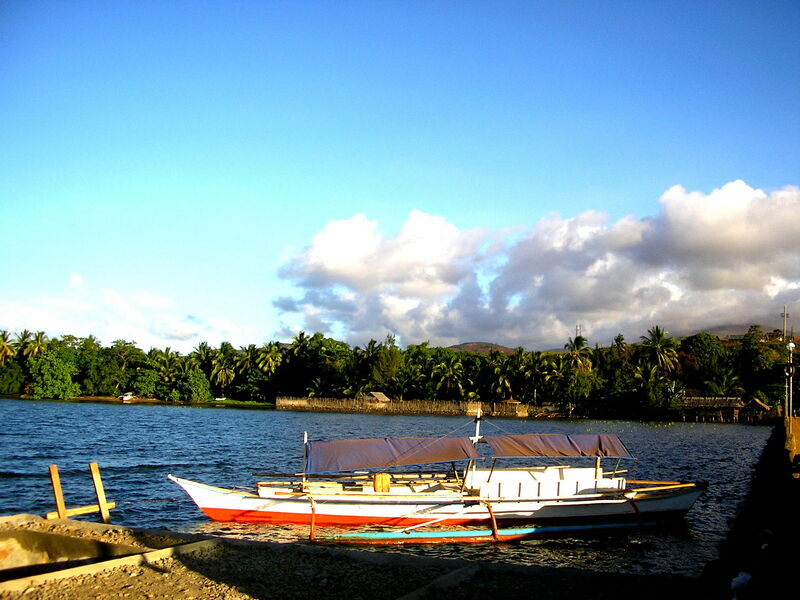 We took our baon and leisurely had our lunch at the dining hall overlooking the calm waters – so beautiful! Angel, Cherry and I enjoyed our lunch talking amidst the serenity of the lagoon – and I was lost in thoughts on our adventures for the rest of the day. 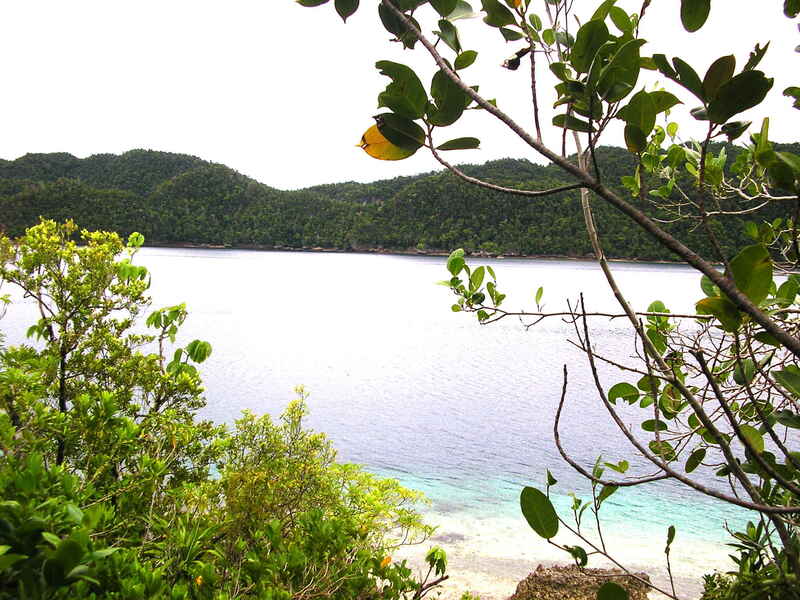 We didn’t want to waste our time so after putting things in order, we got to the boat and left for the Sohoton cove to start off. It was sure on low tide and again as we got into the entrance and maneuvered through it, I had that familiar feeling of being transported into another place – so mysterious. 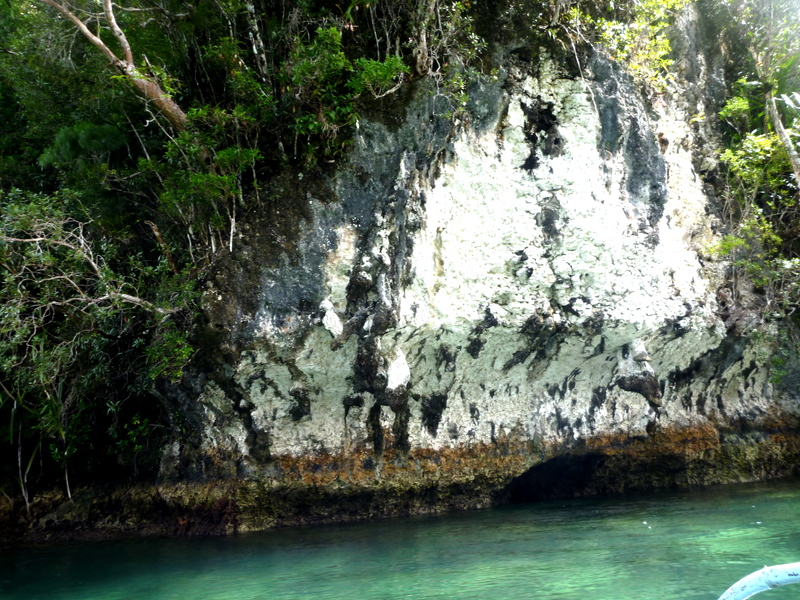 We toured around and swam into Hagukan Cave to view the rock formations and swam in its clear waters. We waded inside the Magkakaub Cave, viewed its unique stalactites & stalagmites, rock climbed on it’s wall towards the exit for the big jump. We lined up, Angel first but he wanted me to go ahead, but in the end he jumped! 🙂 Then Cherry with wobbling legs came next, then finally me but again I gathered enough courage to do so (after having done twice)… We lingered for a moment snorkeling in the clear waters, there wasn’t much fish life though. White beach all to ourselves! I was up early and after my prayers got out side to take early morning photos in the lagoon, it was down cast and started to rain. We packed our things as it was getting late already with our schedule, the rain wasn’t stopping after all. We took our boat and went to the reception area for our breakfast. We discussed again with Dodo about Sohoton’s needs. I told him the spots we have planned for the day. 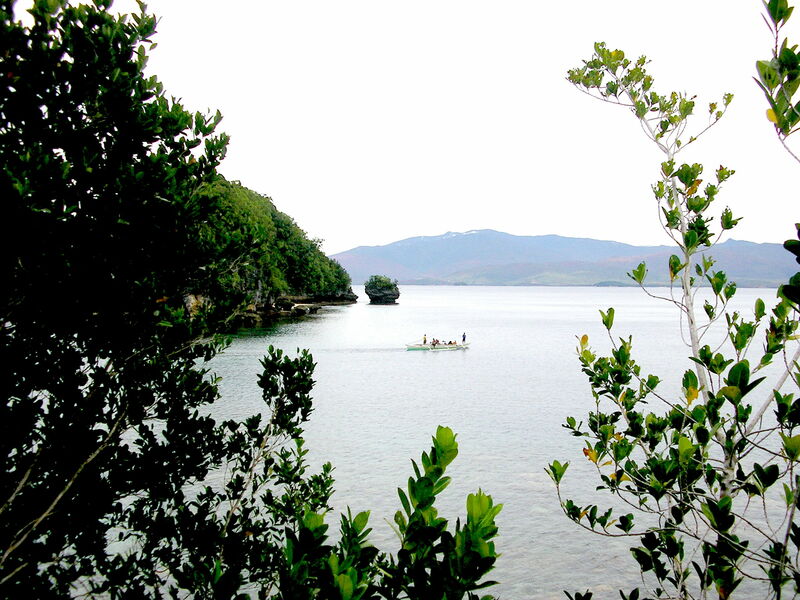 Our first adventure is exploring the Tojoman Lake – lagoon filled with friendly stingless jellyfish. We were early so the lake was all to ourselves. We got down to swim and snorkel, playing with the brownish jelly fish – in different sizes – thousands & thousands of them! Angel was just too excited swimming with them. I swim with them looking at them closely – they’re pulsating as if breathing or maybe shouting! 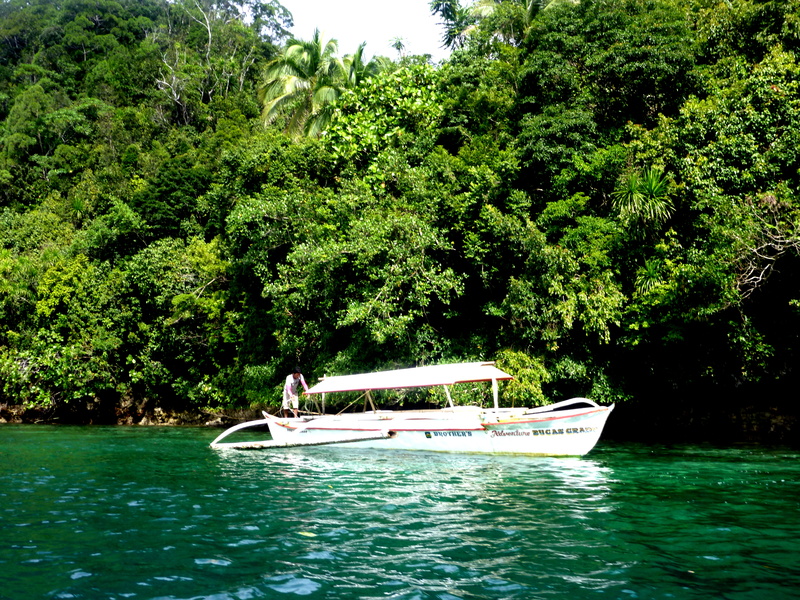 🙂 The boatman motioned for our return but I still wanted to stay, Angel gave me another 15 minutes… Swimming with the jellyfish is my favorite in Sohoton! When we returned at the reception area, we got into the pumpboat with Dodo for Tiktikan Lake. Fortunately the rain had stopped, and we enjoyed our boating at the lake viewing the old mangroves and the elusive resident mother bangus. They have huts and a coop store maintained by the PO. We trekked the trail up and down and get back into our boat, we need to get away with the low tide or we will get stuck in the lagoon. We got next to Bolitas Cave and Crystal Cave – I have been wanting to explore these caves long before. We got first to Crystal – viewing the white rock formations that sparkles, with lighted candles it’s even more sparkling. Now getting into Bolitas is more challenging, it had a small entrance and so you got to lie flat and maneuver your body to get through. I need to be careful or I could get scratches and bruises from the sharp stones, it was bit difficult but we all made it. We lighted our candles again, and went through – white round pebbles abound inside – it’s a wonder how it got there. Then a balinsasayaw keeps on flying darting back and again, our guide tried to catch one and Angel took some photos of the illustrious bird that emits saliva for their nest for a very expensive bird’s nest soup at Chinese restos. The guide told us that the other end of the cave is another barangay with the mangrove plantation – it will take about 2 hours to go through the whole stretch – maybe next time we can do it, I thought. We went out and going through again the small entrance was a test of patience, agility and strength. All of us were laughing as we tried our way out – I felt so dirty when I finally got out. I quickly washed myself in the lake waters. We cruised for Hayanggabon Port with Dodo and Reggie beaming and grateful for the wonderful time at the cove. 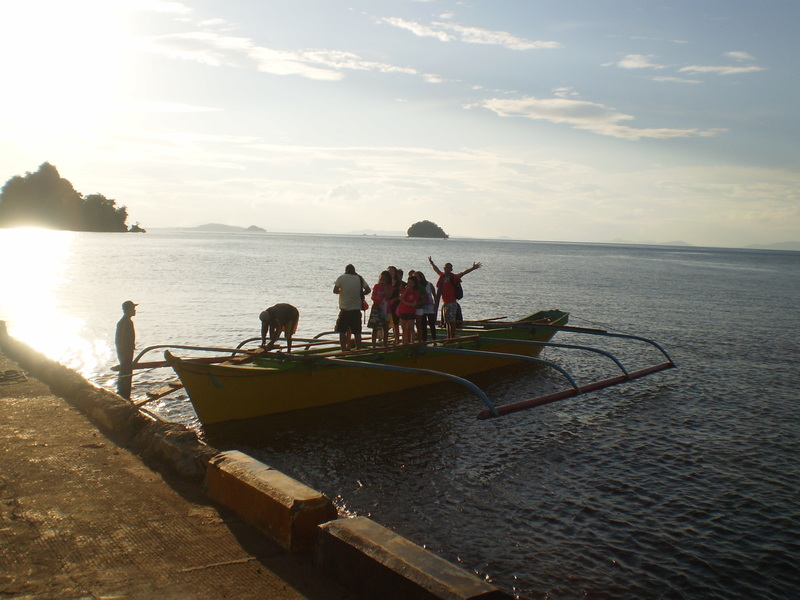 When we got to the port, we waited almost an hour for the bus to Surigao. We decided to go down the city so Angel could catch glimpse around. I called up Gay who promised to pick us up at the terminal. As Gay didn’t know of any coffee shop in town, we went to the Tavern Hotel instead, to have our dinner there. We talked and talked – you know Gay! 🙂 We had a leisure walk at the Boulevard to get the Surigao City by night experience, before we finally left for the bus terminal. We boarded the 10pm last trip bus for Butuan feeling so tired.